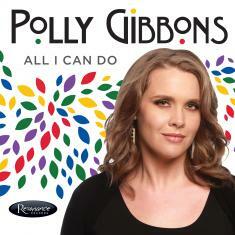 Resonance Records discovery Polly Gibbons, a British-born star on the rise, has a sound and style that give off sparks. It's raw, raspy, and full of heat; it sputters and growls, carves out funky grooves, and wails into the skies. All I Can Do, her third Resonance release, the label's founder George Klabin, places Gibbons in front of an audience, where she's at her most explosive. Recorded before an invited crowd at Power Station, the New York studio where Bruce Springsteen, the Rolling Stones, Paul McCartney, Madonna, and Sting made renowned albums, All I Can Do teams Gibbons with a smoldering quintet: pianist and arranger James Pearson (musical director at the legendary Ronnie Scott's in London); organist Shedrick Mitchell (who played for nine years with Whitney Houston); guitarist Paul Bollenback; bassist Richie Goods; and drummer Mark McLean. Guest pianist and arranger Tamir Hendelman is a first-call musician in Los Angeles, a first-call accompanist in Los Angeles; he can be heard on the CD and DVD of One Night Only: Barbra Streisand and Quartet at the Village Vanguard. On All I Can Do, Gibbons roams the musical map while staying grounded in jazz, her home base. She finds the common thread in songs by Horace Silver, Prince, AND Al Jarreau. She borrows tunes from her idols-Nina Simone, Chet Baker, Donny Hathaway-and makes them her own. As Jon Sobel wrote in the Seattle Post-Intelligencer: "I hear echoes of Ella, Lena, Aretha, even Janis. But Gibbons is a full-blown phenomenon of her own." The performance took place in 2018, an important year for her. That summer, Birdland, New York's premier jazz club, gave Gibbons a residency. She opened for Boz Scaggs at the Montreal Jazz Festival and played the Pittsburgh International Jazz Festival alongside Gregory Porter, Marcus Miller, and Tootie Heath. Gibbons performed regularly at Ronnie Scott's, her London headquarters. Her previous album on Resonance, Is It Me ...?, earned raves. Wrote John Fordham of The Guardian: "Gibbons has proven herself a versatile artist who can switch from an emotionally subtle Cleo Laine-like purr to a soul-gospel wail in a blink, and she has a growing authority as a co-composer with James Pearson ... Polly Gibbons is unmistakably a class act, getting classier fast." A farmer's daughter, Gibbons grew up with her six siblings in Framlingham, a small market town in Suffolk, England. Early on she learned the meaning of the blues: "I've got super-loving parents, but I was very bullied at school, and there was quite a lot of illness in my family." At thirteen she heard her first Billie Holiday record. It led her on a chase to explore other black American musical greats: Mahalia Jackson, Aretha Franklin, Marvin Gaye, Miles Davis, Thelonious Monk. The "history and complexity and pain and anger and joy in that music," she says, "made me very excited and touched me." In 2006, before she had released her first album, the BBC Jazz Awards nominated her in its "Rising Star" category. A few years later Gibbons was singing at Ronnie's in front of Van Morrison, who lauded her "great voice." The great arranger/composer Johnny Mandel-who has written for Peggy Lee, Frank Sinatra, and Shirley Horn-would later comment: "They don't come along very often, but this one's a star." Gibbons went on to open for George Benson and Gladys Knight in their U.K. tours, and (with Pearson) to score first place in the Indie International Songwriting Contest for their song "Midnight Prayer." Peter Quinn of Jazzwise proclaimed her "a truly exceptional, once-in-a-generation talent, possessing a voice of such sizzling intensity and raw emotion you could fry an egg on it." Her 2015 debut album on Resonance, Many Faces of Love, established Polly as one of the freshest jazz voices to hit the U.S. in years. All I Can Do shows her continued growth. Her version of the Horace Silver gospel tune "Permit Me to Introduce You to Yourself" mixes funk, scatting, and churchy organ and piano; Polly sings as fervently as a preacher in the pulpit. Jazz divas love to emote their way through "Everything Must Change," but Polly transmits its hard-earned lessons quietly. On a tip from Klabin, Polly sings a rollicking cover of a Della Reese showstopper, "Some of My Best Friends Are the Blues." She and Pearson wrote "All I Can Do Is Sing the Blues" in response to "the bad things in life," most of them stemming from current political mayhem on both sides of the pond. Following the death of Prince, Gibbons was moved to sing "Nothing Compares 2 U," his great ballad of lost love, in a spare and mournful setting, "just Shedrick and James laying it down." "I Want a Little Sugar in My Bowl," the unashamedly naughty Bessie Smith blues, never fails to thrill Gibbons's audiences. Pearson takes it to church with an arrangement inspired by Mahalia Jackson records; Tamir Hendelman channels every style Gibbons loves into a panoramic solo. All I Can Do reveals a young woman who, musically and expressively, is wise beyond her years. CD AND DIGITAL FORMATS AVAILABLE ON APRIL 19, 2019.